How far should one go to seek out the good and destroy evil, and what consequences might their choices have? After Lisa barely manages to escape an invasion from the Rebel army in her home of Malta, she discovers Exo. This ancient dimension is made of memories from the past. It is here that evil manifests as flesh. It is here that the legacy of centuries of darkness can be stopped from whispering to our ears. Lisa desperately wants to resolve the conflicts of this inner world peacefully, but quickly learns she must fight the shadows in people&apos;s hearts materialized through battle re-enactments, warfare and emotional turmoil. This book had a lot of interesting elements. Time travel, shamans, a protagonist who travels to outer space—there was no shortage of remarkable things happening here. I want to say this wowed me and that I was drawn in to the many time periods and concepts traversed in this book. Rather, I am walking away feeling confused and like there was something in this story that stayed just outside my reach. Lisa, our main character, found herself able to enter a sort of dream state after a traumatic event in her childhood. 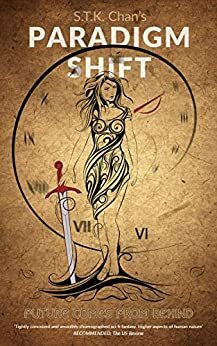 In her late twenties, she learns this dream state is the result of her shaman status and that she can stop evils from different time periods in Earth’s timeline. This leads to many action scenes and many discussions on inner truth vs. external understanding. It was all very fascinating but felt inaccessible to those who aren’t already well-versed in advanced shamanistic teachings. Away from Lisa’s shaman world (called Exo), she leads a physical life that I felt didn’t really meld with the shaman side until the very very end. She is a scientist in real life, and again, the science felt like it was beyond the average person’s understanding. There are many, many characters, and the POV jumps between them at will. This made following the story tough. Even more, it made connecting with the characters difficult. Most of the story seemed to be Lisa, but even so, she never felt fully fleshed out. Getting little glimpses into the thought processes of so many others left me feeling like I’d been introduced to too many people at a party. Overall, I think this book has a lot to offer but not necessarily for everyone. I spent most of my time confused. When I wasn’t confused, there were some truly visionary things happening, and the book gives some fantastic commentary on different time periods. Perhaps I needed to be in a different mindset to fully understand this. Nevertheless, I think those who want a book they can read over time and really ponder would enjoy this. "future comes from behind" by S.T.K. Chan depicts the journeys that a female named Lisa participates in as she becomes fully immersed in experiencing the dimension of Exo and learns how to interact with her fellow shamans as they attempt to battle evil by subtly altering past events. This thought-provoking science fantasy tale is the first book in the ‘Paradigm Shift’ series. Through a series of vignettes, the author shows how a specially talented female hones her skills by participating in various key battles throughout history. Unfortunately, the abrupt shifts between time and location interspersed with the snapshot looks at the main couple’s lives was disconcerting to me and sometimes it was difficult to discern when and where we were in Lisa’s existence. The cast of characters keeps growing even as the hints about Lisa’s power and role are gradually doled out, and it was sometimes difficult to figure out what was going on, especially with the folks who may be at different levels of expertise or power in the mysterious realm of Exo. The various rules governing what may or may not be shared and the mysteries hinted at regarding Lisa’s (and the world’s) future are somewhat nebulous and hopefully will continue to be revealed in subsequent books. I think that the premise is good, and the creative way of distilling key conflicts around the world during various eras of history will undoubtedly appeal to those who enjoy analyzing the permutations of the butterfly effect on historical battles. 4.0 out of 5 starsFans of Doctor Who and Star Trek will love this! Can the battle of good and evil be won through time travel? Lisa and her family must flee Malta and while on the run, she stumbles upon Exo, a sort of freeway consisting of memories and echoes from the past. When travelling the past, present and future, Lisa can communicate with shamans and help bring peace to the world. As each battle is re-enacted in Exo, there are lessons to be learned and steps to be taken. But at what cost? Will those travelling through Exo stop the evil incursions or is it inevitable? Taking cues from Doctor Who and Star Trek, Chan creates a brand-new fantasy universe filled with philosophical questions. Time travel is risky, there are rules to obey and a true moral dilemma. Can you travel through the past without changing too much of the future? There are a lot of characters with plenty of POVs. While I don’t care how many POVs there are in a story, I found the transitions choppy. I kept scratching my head trying to figure out what just happened. I got lost a few times and had to keep reading what I just read. The characters themselves were fascinating and I had a few favorites. I loved Lisa as well as Kaelan. Opposing personalities in how they battle evil but both on the good side. Fleshed out, the characters were a delight to read. The battle re-enactments of past historical events captivated me and stuck with me long after I finished reading. If you’re a fan of history, you’ll love these scenes. If you’re like me and like an adventurous fantasy with plenty of action, pick this up today. It’s an exciting first book in the series and I can’t wait to see what happens next. Disclaimer: I received a copy from the author in the hopes I'd review it. This is a story that really makes you think! The author immediately draws you in with a lot of action packed scenes. Lisa is an exceptional character that held my interest throughout the story. This was a great sci-fi fantasy story that makes you really think hard. A good story! Hope to read more from the author! 3.0 out of 5 starsThis is a short book of less than 300 pages that will keep you entertained for a while. Check out the Amazon Profile for the Inkish Kingdoms blog and commentary!